Roam the jungles of central Mexico in search of your Aztec treasure. Click here to play! Help the Aztec king navigate the jungle to collect relics and treasure. It's an adventure full of danger but you will be rewarded with a small fortune should you be successful. The Aztec King is in search of his queen. He only appears on selected reels, but he does substitute for all other symbols excluding scatters. This makes your quest to win easier as he helps to create winning lines. If you're lucky enough to find five Aztec Queen symbols across a pay line you will receive 5000 times your original line wager. You might come across a few vicious creatures along the way, but not to worry because they will help you. Two or more jaguars can pay out up to 2500 times your wager. 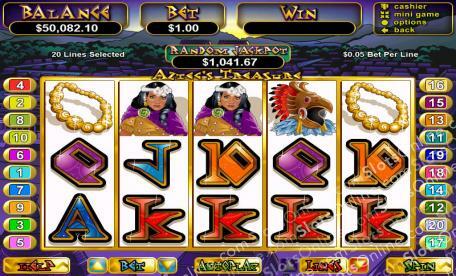 You'll receive 1000 times your wager should you encounter five Aztec gods. Other symbols such as jewels and golden symbols pay out 500 times your line wager. Of course, Aztec idols are the ultimate bonus prize. Three or more of these scatter symbols will trigger free games. And if you're lucky enough to get these idols during your free games, you will be rewarded with a bonus prize equal to your original bet. Best of all, all prizes won during your free games, except the bonus prizes, will be tripled. Now is your chance to discover the innumerable treasure of the ancient Aztec civilization. Three to five Aztec Idols triggers free games. Each subsequent idol in the free games is awared with a bonus prize that equals the triggering bet. The Aztec King is a fiercesome man with a green headdress and face paint. He appears only on reels 2, 3 and 4 and substitutes for all other symbols except the scatter symbols.